Emergency ATV Tire Repair Tips. We tell you what you need to pack in your emergency ATV tire repair kit. Performing an ATV tire repair out on the trail is not something anyone looks forward too. But when it's the difference between walking or riding home, you need to know how to do it the right way. That's why we've compiled this collection of favorite tools and techniques into a list of tips for that inevitable trail emergency. We'll through in the standard disclaimer that these tips aren't intended to be for permanent repairs. They're meant to help you get out of the middle of nowhere when you find yourself stuck with a flat. First, we'll give you a quick description of the tools and materials you'll need. Also covered will be some that may not be necessary, but nice to have. As always, there's not really one best way to do a trail side ATV tire repair, so you'll need to decide which methods you're most comfortable with. Let's get started. If you'd rather shop first and read later, just click the links below. Pliers/side cutters - Some combination of needle nose or square nose pliers and a good pair of side cutters will be necessary for removing the offending object from the tire. Side cutters are also handy for trimming the tire plugs one they are installed in the tire. If space is limited, and you just have room for one tool, we've found a good quality pair of needle nose vise-grips gives you the best shot at removing most things that commonly cause tire punctures. Knife - A knife with a stout blade isn't just good to have in an ATV tire repair kit. But even for tire repair, knives have several uses. They can be great for helping to get the cause of punctures out of the tire, trimming tire plugs to length before installing, and trimming the plug after it's in the tire. 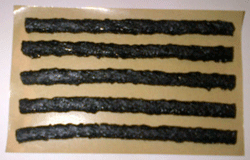 Tire plugs - For emergency trail side repairs, the string type plugs like the ones in the photo are the easiest to use. They generally come in 4 to 8 inch lengths, but can be cut to whatever length you need. If you just want to carry one length, we would go with one of the longer ones since they can always be trimmed. Another tip we've learned the hard way is to make sure the strings are relatively fresh. They will dry out over time and lose their adhesive quality. It's a good idea to store them in a zip lock bag after the original packaging is opened. It will still be a good idea to check them before riding in an area that's very far from civilization. 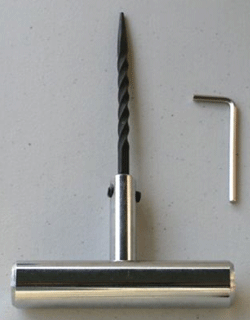 Tire reamer with metal handle. Reamer - If you're putting together a four wheeler tire repair kit for emergencies, don't even consider using one of the cheap plastic handle reamers. Let somebody else discover what happens when you're trying to ream a hole in 6 ply radial tire and the plastic handle on the reamer breaks off in your hand. For those that choose to ignore this advice, we'll cover first aid kits in a different article! Just get one of the beefy metal handle reamers like the one shown on the right. Sure, they cost more, but this isn't the time to scrimp on such a critical tool. You'll also notice that the bits are held in place with locking set screws and can be easily replaced if one breaks. That means you can carry some spare bits and be ready to go. 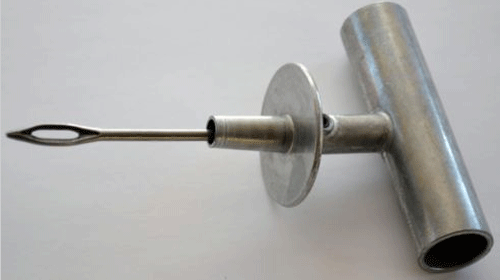 Insert hook - Same advice applies to the hook/insertion tool as the reamer. Get one with a burly, metal handle and set screw type bits. We'd also recommend the knuckle guard/depth gauge like the one pictured below. It also helps the plugs disengage from the hook so they won't be pulled out too far when the hook is extracted from the tire. Metal handle insertion hook with depth guide. Lubricant - Any good ATV tire repair kit should include some sort of lubricant for the reamer and hook bits. Although this seems like a minor point, when you're in the middle of nowhere, you need everything to go as right as possible. Sealer - A bottle of tire sealer is a good backup plan for times when the tire plugs don't seal completely. We would never depend on JUST a bottle of tire sealer though. The kind of punctures and cuts that ATV tires are prone to getting are often too large and ragged for the sealers to work. You need a physical plug to fill the gap first. 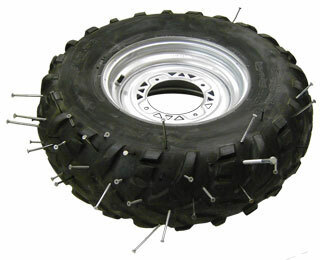 Tire inflator - Once the tire is repaired, you'll need some way to inflate it. 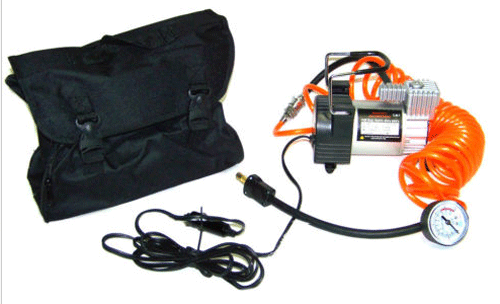 These include the cans of inflator/sealer, CO2 cartridges, manual tire pump, and electric mini-compressors. Any of those can work, so it really depends on which one you're the most comfortable using. We've had enough failures with the cans that we wouldn't trust them in an emergency atv tire repair kit. The CO2 cartridges can also be a little tricky to use, and you'll have to carry several to have enough capacity to inflate an ATV tire. A good quality foot operated tire pump can work, but they're a little bulky to carry on some ATVs. Our personal favorites are the electric mini-compressors. Quality is all over the place, along with price. You may have to do a little homework to find the best one for your use. Reliability is our priority when it comes to including one of these in an ATV tire repair kit we would depend on in an emergency. 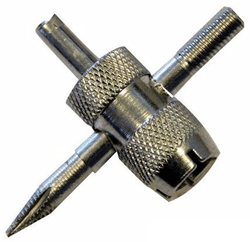 Valve core tool - A tool for deflating the tire and/or removing the valve core from the stem needs to be part of any atv tire repair emergency kit. The tool pictured at the right is our favorite, since it has thread dies to repair both the inner valve core and outer valve stem threads. Along with the tire valve tool, be sure to pack some extra valve cores in your repair kit. Tire pressure gauge - Any ATV tire repair kit should include a good tire pressure gauge. Our favorite is a simple, tough mechanical gauge with a low pressure scale. The pen style like the one below takes less space and tends to be tougher than any dial type gauge. The digital gauges are fine in the shop, but we've just had too many failures in harsh conditions out on the trail. Tire pressure gauge with low pressure scale. If you're in the mood to do some shopping, just click the links below for great deals on the items listed.